The state-owned enterprise “Scientific-Production Center “Energoimpuls” of the Institute of Electrodynamics of NAS of Ukraine was founded according to the Resolution of Presidium of NAS of Ukraine of 13.07.09 №224. The main objective of the center is implementation of the results of fundamental researches and developments of the scientists of the IED of NAS of Ukraine, primarily in the areas of resource- and energy saving, improvement of the efficiency and reliability of the modes of electrical power systems and their components, and metrological support in energetics. The address of SPC "Energoimpulse": 03680, Kyiv-57, prosp. Peremohy, 56. 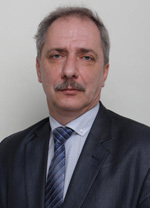 The Head of the Center – Alexander Lameko. Over the years of its activity, the SPC “Energoimpuls” has gained a considerable experience in creation of conductometric biosensor systems, implementation of variable frequency electric drive on the objects of housing and communal services, execution of various measurements by electrotechnical laboratory established by the enterprise, etc. The Center delivers its developments to the customers in Sweden, France and Russia. We offer to get acquainted with scientific and technical developments of the scientists of the Institute of Electrodynamics of NAS of Ukraine implemented by SPC “Energoimpuls”. We are looking forward to receiving your partnership proposals!